Betsoft presents Yak, Yeti and Roll which follows the adventures of the peculiar Eskimo Inventor Yak and his trusted Yeti companion in a wild arctic ride for up to x200 stake! Highlights of the slot include the Snowmobile Trail Bonus, wilds, scatters and Double Up feature. 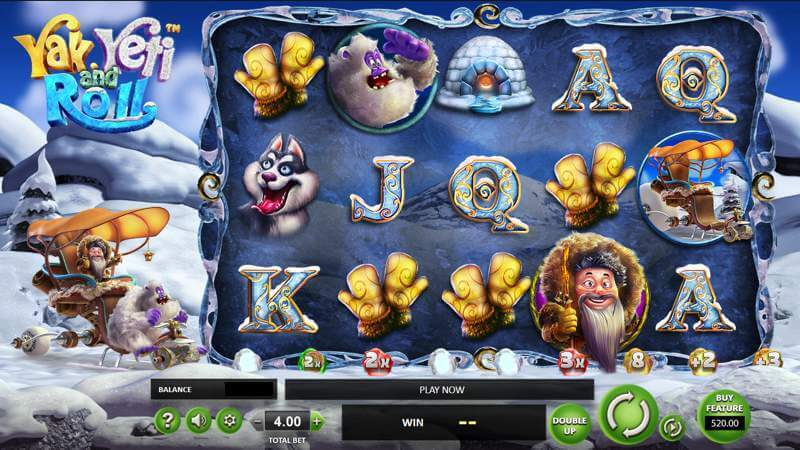 Betsoft has designed this slot in a cartoon-like style. The icy-blue translucent reels, which are set in a snowy landscape, hold all sorts of symbols that include a grey wolf, reindeer, igloo, sleigh and mittens. The characters are designed with personality – sometimes endearing and other times amusing but collectively contribute to the overall charm. No less compelling is the soundtrack which is mingled with audio effects and intermittent animation that keep things fresh. Buried beneath the snow are five royal flush poker symbols. The Yeti wild can act as a replacement for all the other symbols except the Yak Eskimo scatter symbol. This wild can only be uncovered on the 2nd, 3rd and 4th reels, meaning it also does not form an exclusive winning payline. Our Eskimo professor, going by the name Yak, is the scatter symbol who will reward cash, regardless of position when appearing uncovered in sets of 2, 3, 4 or 5 for up to 3, 12, 30 or 150. Yak, Yeti and Roll is a cascading slot, played out on 5-reels and 20 fixed paylines, which can continue in an unbroken chain up to a maximum of 17 times. Upon being triggered, the snowmobile picks up speed, shovelling up snow as it goes, to uncover treasures that were previously lost. Excitingly enough, these treasures may be in the form of instant cash prizes, free spins, cascade multipliers or free spins multipliers. For an opportunity to increase your winnings after a successful round, the slot presents the Double Up Game at the conclusion of the cascade feature. You are given the option of gambling all or 50% of your winnings by calling heads or tails on a coin spin. The heads or tails feature is a double or nothing game. As this feature is optional, you can instead elect to side-step it entirely. Popular to the newer slots from Betsoft, the Buy Feature is a method of buying into 18 free spins with a x4 multiplier for a price that you’ll find displayed to the bottom right of the slot. The RTP of Yak, Yeti and Roll slot varies from 95.93% to 96.54% depending on whether you opt to play the Buy Feature. Wagers can be adjusted from 0.40 to 12, assuming the Bet Feature is not activated. This December 2018 release has been optimised for pc, tablet and mobile use and can be played anywhere, ideally with a wifi connection, using an Android or iOS device. If you like dashing through the snow, then we think you may also like dashing to one of our recommended casinos! Fancy dashing through the snow? Yak, Yeti and Roll take you into a virtual snowy landscape in this fun slot game.